The book store experience is just different these days. I love ebooks and being able to order literally anything online, but something is lost when you no longer have to physically go to a place to get something new to read. In my family, going to the bookstore was an event, one of our favorite weekend pastimes. The two book stores that I miss the most technically still exist. Dad used to take us to Triple Goddess, a new age joint that sat across from our hair salon. I loved the chakra sunglasses, fragrant oils, and unusual greeting cards. (One said, "I saw a little girl picking worms off the sidewalk so they wouldn't drown, and it reminded me of you.") I loved how the owners had their dog's aura pictures on display. 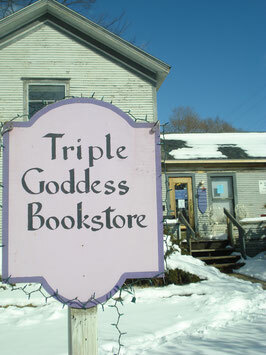 Today, Triple Goddess is a part of Everybody Reads, an indie bookstore downtown. Although I love Everybody Reads, I miss that original building. It was bought by my hair salon because they were going to expand, but then they didn't, and it's been torn down. That empty lot is a total bummer. Barns & Noble also still exists, and it's a massive chain, so maybe I shouldn't feel too nostalgic about the specific Grand River building, but I still do. It used to be a grocery store. 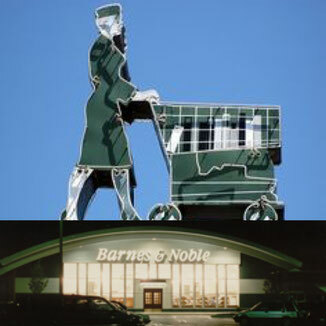 The neon sign outside had a lady in 1950's garb with a shopping cart, except they had somehow been able to make the neon groceries look like books. Upon walking inside, the first thing you would notice was the massive fan, turning slowly above a balcony--which I always wanted to explore. Below, I'd be on the hunt. The books I found helped me make sense of the weird grief I felt at becoming an teenager. They sparked my imagination, providing inspiration for the books I would write someday. This building is now a Playmakers. They renovated the balcony, and I can go up there to look at shoes, which my younger self would be pumped about, but still, I wish it were books. Now attached to the too bright, bustling mall (Is Lansing Mall bustling? ), our current Barns & Noble doesn't have that same feeling of walking in and immediately being separated from everything else. What were your favorite book stores back in the day? What book stores do you miss?